To determine the cost per serving for a particular cut of meat, determine the number of servings per kilo for the retail cut. Then divide the price per kilo by the number of serves to find the cost per serve. Keep a small calculator in your handbag when shopping for meat to help with this step. Doing this can be especially useful to compare the cost per serving of two cuts. 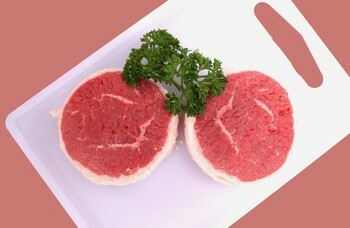 For example, a blade roast costs $4.59 per kilo and a boneless rump roast costs $5.29 per kilo. Which is the best buy? 1. Determine servings per kilo. Boneless rump roasts - six servings per kilo. 2. Divide the price per kilo by the number of serves. In this example the boneless rump roast would be a slightly better buy. Using this method to compare the cost per serving can give a truer cost per meal and thus help the household food budget. It also helps in calculating exactly how much meat you need to buy.